Sandeep Daniel is a smart dynamic preacher and corporate trainer who has to his credit 22 years of excellent work experience in God’s kingdom and the corporate world. He is known for his excellent communication and PR skills that help deliver the Word with precision and impact. A leader by his own merit he is actively involved in religious-social causes delivering sermons, conducting seminars and training sessions all over the world. He has worked as the ‘Station Head’ for a reputed multinational company rendering more than 21 years of valuable service. He has been chosen to represent his MNC many times over, to attend training abroad that would sharpen both his professional and personal skills. He has an impressive track record of completing each one of them with distinction A person is known for his integrity, linguistic proficiency and winsome personality, Sandeep is also sought after in various organizations, corporates, and educational institutions as guest speaker. It has been his privilege to lend a ‘Voice’ to the ‘Voiceless’ and be a brand ambassador for various worthy social causes. Sandeep Daniel believes that God promises us spiritual sight to achieve success in our respective sphere of operations. While there are seasons of urgency and windows of opportunity, he believes that each person should be equipped to discern God’s timing. He being a Evangelist, Corporate Trainer and a Speaker travels the Nations to equip the body of Christ to usher the Kingdom of God on this earth. His ministry mission mandate is “Plunder Hell – Populate Heaven”! My name is Sandeep Daniel and I am deeply passionate about connecting with people and sparking conversations that can mutually build each other up. Even while doing ministry, I had always pitched my tent in the corporate world (accounting to over 22 years of experience) as the Station Head of an International Airline Company. But nothing gave me more purpose than working in God’s ministry, which I am currently fully devoted to. Being a travelling Preacher, Speaker and Corporate Trainer- I am actively involved in delivering sermons and conducting seminars on a Global scale. I believe that God promises us spiritual sight to achieve success in our respective sphere of influence, be it our homes, our churches or even the daunting marketplace. While there are seasons of urgency and windows of opportunities available we need to be able to discern God’s timing. Therefore I believe it is my calling to equip the people of God to be Kingdom Giants even in the corporate set up, who are relentless in pursuit of integrity, excellence and goal focussed mastery. My ministry mission mandate is “Plunder Hell – Populate Heaven”! Dear friends. We are having our next meeting this Friday 21 Sept @8.30pm . 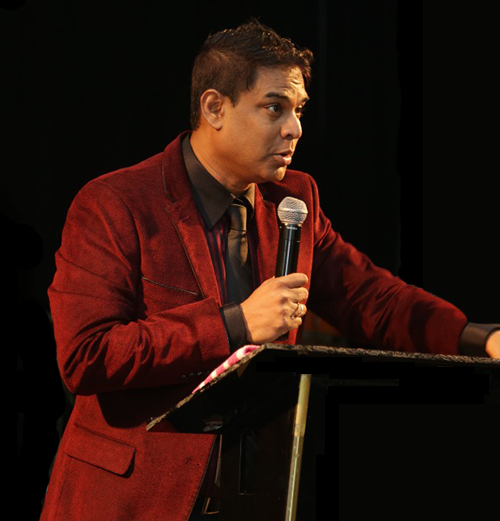 Our guest speaker is Bro Sandeep Daniel , who is a Bible teacher, Evangelist and Corporate trainer. Apart from christian ministry, Daniel also has many years of corporate management experience in an International Airline company. Born into a christian family, Sandeep fell into drugs, alcohol and substance abuse, until he had a conviction of heart through reading the Bible. Today he travels extensively to many countries to preach & teach the Word of God. Do invite your family & friends to hear the Word of God and to receive prayer for any needs.